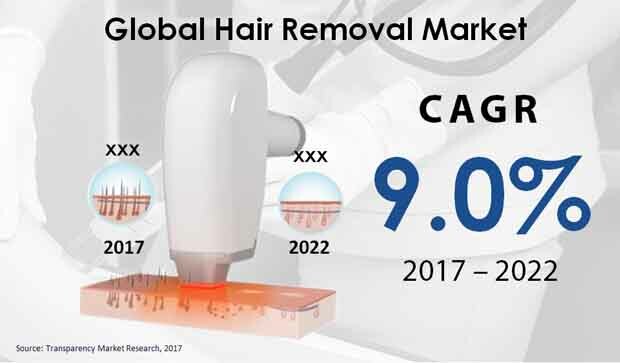 The global hair removal market is prognosticated in a report by Transparency Market Research (TMR) to witness a high degree of competition as top companies go head to head to cement a strong position in the industry. Leading players such as Lynton Lasers Ltd., Solta Medical Inc., and Cynosure Inc. could make a telling impact on the market. According to the research presented in this report, companies are anticipated to improve their profit margins by concentrating on the technological development of their products. The market could expect the entry of a large count of new players in the coming years. TMR foretells the global hair removal market to bag a US$1.35 bn by the completion of 2022 while growing at a 9.00% CAGR during the forecast tenure 2017-2022. In 2017, the market was worth a US$0.88 bn. On the basis of product, intense pulsed light (IPL) could take the lead in the market while expanding at the same CAGR. By region, North America is projected to dominate the market as it posts an expected CAGR of 9.50%. The world hair removal market is prophesied to gain impetus with rising emphasis on personal grooming and aesthetic beauty. It could be positively influenced by aggressive demand for hair removal products and services owing to increasing consciousness of beauty among people. In the next few years, there could be a considerable rise in market growth boosted by several technological developments. Sales of hair removal products could see an increase because of constant increment in purchasing power of consumers. Demand for IPL devices is predicted to swell due to their high efficiency and easy availability. Sales of extortionately priced hair removal products could be helped with increased disposable income of consumers in North America. Furthermore, high interest in self-grooming witnessed commonly among people is envisaged to multiply demand for hair removal in the region. The international hair removal market is expected to grow healthily in the near term. However, certain factors such as expensive cost of permanent procedures could stunt the growth of the market. Another factor envisaged to hamper demand in the market is unhygienic use of hair removal products and rising number of cases of infection. Nevertheless, there could be rewarding prospects taking birth in the international hair removal market, helping players to improve their revenue growth. This could be evidenced by swelling demand for personal care products such as wax and wax strips, epilators, shaving razors, and hair removal creams. High demand for hair removal products and services in beauty clinics is projected to create a wealth of lucrative opportunities in the market. Dermatology clinics, on the other hand, could push market growth by cashing in on increasing popularity of laser therapy.